A retreat into sublime sensations. Hidden away in a vast palm grove on the outskirts of bustling and mysterious Marrakech one finds the Sublime Ailleurs, a true oasis of style, serenity and hospitality. This hotel consists of three luxurious residences of Moorish architecture where the emphasis has been given to space, light, comfort and the privacy of the guests. Each one has its own swimming pool, garden and unique style, two of which are Art Deco and the other is inspired by the Orient. One enters these sophisticated spaces, where modernity is subtly combined with the tradition present in the talent of the local craftsmen who have built all the surroundings. The engraved ceilings, the marble and the wrought iron, the pieces in bronze and silver, the velvets and the silks, all bear witness to their art. Daily, the two chefs prepare their gourmet meals with several ingredients grown on the estate of the hotel and creatively combine Morrocan flavours with Mediterranean ones. In the late afternoon the butlers will serve a refreshing tea in the tranquillity of the garden or on the terrace with a view from the palm grove all the way to the Atlas mountains. The personalised service offered by a discreet, attentive and smiling team is exceptional and contributes greatly enriching this sublime experience. Upon leaving the Airport, take the main street in Fez until arriving at a roundabout where there will be an orange sign indicating that the hotel is to the left. Continue straight ahead, passing the Eldorado Hotel and the Marmarra Club. Further ahead there will be another sign indicating the entrance to the Sublime Ailleurs. "A small bit of paradise just outside a wonderfully colorful city. Thank you for looking after us too beautifully. "Wonderful, sublime and like paradise, can't wait to come back and visit again. Amazing, lovely staff and the villas are irresistible. 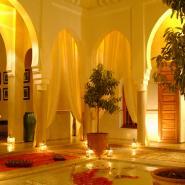 I cannot wait to come back"
"To the wonderful staff of Sublime Ailleurs: Thank you for your attention care during our honeymoon in Morocco. Sublime is aptly named. What a delicious metreat: special word to Hicham who took great care of us! "A huge thank you to the wonderful staff who made our holiday here so unforgettable. A wonderful relaxing environment, we look forward to coming back." "But yes we enjoyed very much the staying in Sublime Ailleurs. We have been treated very well."